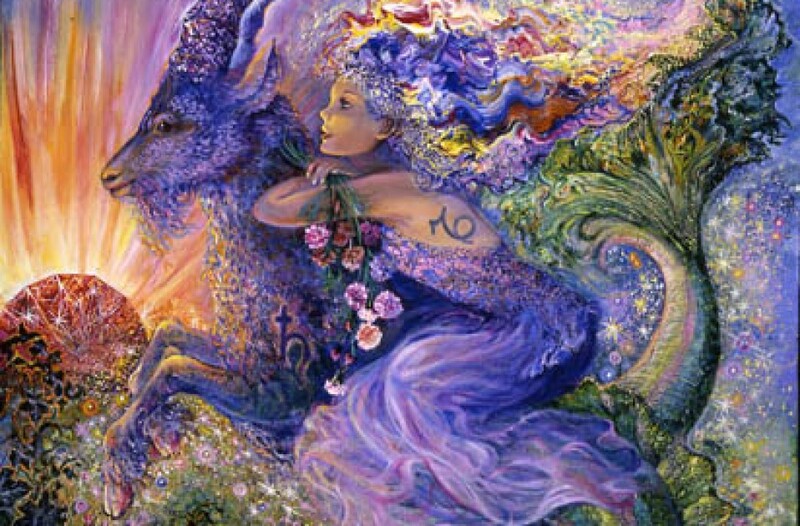 New Moon in Capricorn_ Bringing Back the Divine Feminine! 2018 begins with a dynamic month filled with two Full SuperMoons on the 1st and 31st, Uranus going direct, Mercury coming out of its shadow period after retrograde, Jupiter and Mars together, and a lunar eclipse January 31st. This first New Moon of the year in Capricorn is fertile ground for honoring, tracking and refining your intentions to move along a new path. New Moons are times to plant a seed and cultivate its growth. With Sun, Moon, Venus, Pluto, Mercury, and Saturn all in earthy, active Capricorn and no planets retrograde in this chart, you are on a launch pad and in the hands of a master creator in the middle world/material plane ~ so much trustworthy, reliable support. You are also planting your intention seeds for the two and a half year journey of Saturn through Capricorn. Saturn in its own sign is like Saturn squared. Imagine you haven’t seen this revered master in nearly 30 years at this place in your chart. He has returned. When you are finished with your initiation and training by Saturn in the next several years, what do you want to have accomplished? “Something new is emerging in our collective consciousness. It is a feminine vision of life. And we see this idea repeated by the conjunction of Venus, Sun and Pluto on January 8th – 9th. The New Feminine, birthed back in 1969, when we all first saw Earth from the surface of the Moon, has been in exile since the late 80’s – the last time Saturn was in Capricorn. Publishers stopped publishing books on the Goddess, we had reactions to the feminist movement and it seems the Goddess was exiled to the desert for awhile. But there She developed her Eagle wings and now She’s ready to fly. This New Feminine spirit is different from the women’s movement back in the 60s. Back then, women wanted outer e quality with men, which we never really achieved. We took on the masculine attitudes of rationality, hierarchy, competition, action and individualism. Now women are banding together to express our own power, different from men’s power. But equal to it. It’s time we reclaimed the feminine powers of emotional intelligence (not emotional overwhelm like Trump), intuition, introversion, compassion, vision, connection and wisdom. Which our intellect and individuality will support and nurture. The energies of 2018 are aligned with the Divine Feminine. When Uranus goes into Taurus in late May, all the outer planets will be in Earth and Water signs. (Uranus in Taurus, Jupiter in Scorpio, Saturn and Pluto in Capricorn and Neptune in Pisces). The cosmos is ready to help us. The world is ready to accept our abilities and skills. But we need the sacred Feminine as our foundation, so our sacred Masculine energy can build our vision. It’s time and past time to acknowledge your own Light and let it shine out into the world. What you radiate will come back to you – so open your heart and let your love shine out! Cathy Pagano at Wisdom of Astrology talks about the Re-Birth of the Divine Feminine. We are on a new trajectory, a new three year timeline with the change of planetary influences that is occurring. This brings to mind for me my own connection with the Divine Feminine and its influence in my work! From the time I began working as a healer, I was guided to work with the process of surrender, which is indeed a Divine Feminine energy practice. I worked with Kuan Yin, the Bodhisattva of Compassion, and had many powerful experiences. We know that we must balance the masculine and the feminine in the world; the masculine has dominated for some time now. And to do that we must revitalize the feminine and balance the two! So here comes Saturn in Capricorn to support that process. “Steady as she goes”, as the saying goes. It will take some time, but the opening is here for this. Bring the wisdom of your feminine nature back into your life! She’s still there. Just invite her back into your life and allow her to operate consciously again. It’s time!